The paths of Pioneer 10 and 11 and the similarly distant Voyager craft. A mysterious anomaly in space seen on two NASA probes that has caused scientists to question the laws of physics may just be a trick of the light, a new study suggests. 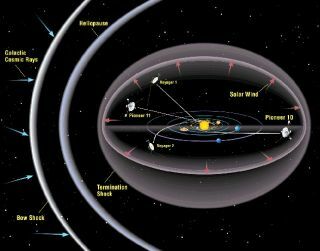 The study may answer questions dating back more than a decade, when anomalies were seen in the trajectories of the identical Pioneer 10 and 11 deep space probes as they hurtled out of the solar system. Both seemed to experience a tiny, mysterious amount of acceleration that seemed to hold them back as they headed away from the sun. A host of potential explanations have been tossed around regarding this so-called Pioneer anomaly. At times, these explanations are based in conventional science ("perhaps leaks from the spacecraft affected their orbits"). Other times, they are rooted in more speculative physics ("maybe our theories regarding gravity need to be modified"). Initially, researchers suggested that heat radiating from the plutonium powering the spacecraft might explain this enigma. Light does exert an extraordinarily tiny but definite amount of pressure, a fact that solar sails rely on to move through space. This idea was at first discounted because it could not cause the constant acceleration suggested by the anomaly, but later research hinted that inconstant levels of acceleration could also explain the mystery. Now physicists at the Higher Technical Institute in Lisbon and their colleagues have discovered that it can account for the entire anomaly if one considers not only the heat the spacecraft emit but also the full effect of the heat they reflect. "Fully accounting for the reflections did not provide only a correction to our previous calculation of the thermal effects, but added a considerable amount to them," researcher Orfeu Bertolami, a physicist at the University of Porto in Portugal and the Higher Technical Institute in Lisbon, told SPACE.com. "We now need to wait for the results of the other teams performing thermal analyses. We expect that their results will be fairly closed to ours. If so, the Pioneer anomaly will be pretty much closed," Bertolami added. The scientists detailed their findings online in a pre-print paper posted March 27 to the online astronomy research site arXiv.org.